June 20, 1998, L. G. Crabo. 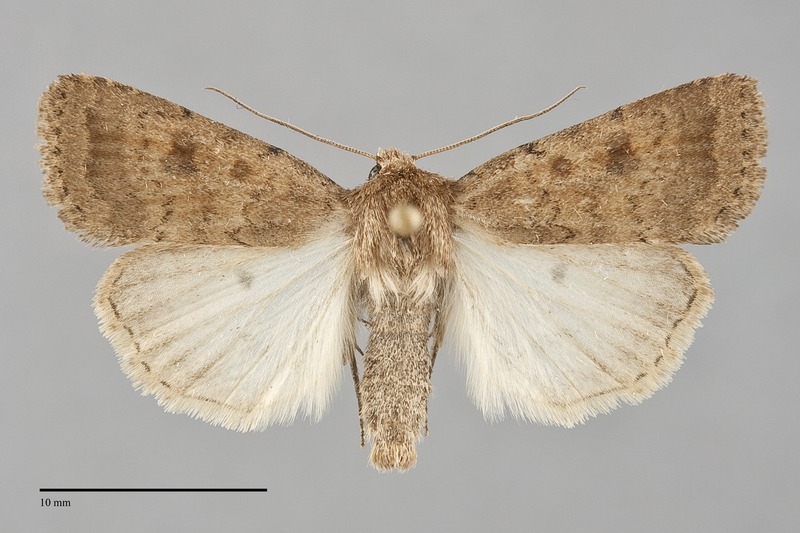 Caradrina morpheus is an introduced small to medium sized moth (FW length 12 - 15 mm) with light brown wings marked with smudged darker brown spots and a gray band across the distal wing in the subterminal area. The wing is slightly mottled and has a slight brassy sheen. The entired wing distal to the postmedial line is gray, with the subterminal area darker than the terminal area and separated from it by the slightly uneven pale yellowish subterminal line. The basal, antemedial, and postmedial lines are thin and gray and weakly scalloped. A faint gray median line is also present. The orbicular and reniform spots are similar, dark gray with a rusty cast that extends slightly outside the outline of both spots. The orbicular spot is small and round, while the reniform spot is kidney-shaped or weakly figure-eight shaped. The claviform spot is absent. The hindwing is light yellow gray - slightly darker in females - with a slight gray suffusion near the margin that is darkest on the veins and a small gray discal spot. The head and thorax are uniform, the same color as the forewing. The male antenna is filiform. This species can be differentiated from our other species of Caradrina by the brassy brown forewing color and off-white yellowish hindwings, white in the other species. It is more similar in general appearance to species of Protoperigea but is unlikely to occur in the desert and dry forests where they are found. It is also smaller than any of the Protoperigea species except Protoperigea anotha that flies at high elevation. 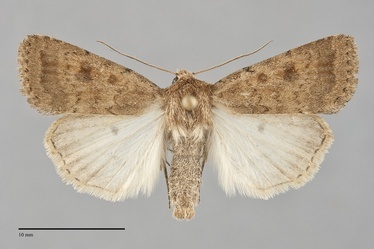 This species lacks the yellow tone of C. morpheus, has a smaller gray orbicular spot without red or orange color, and has gray on the distal forewing that is more diffuse than in C. morpheus. This species is common and widely distributed in moist open meadows and grasslands across Eurasia. It is an exotic introduction in the Pacific Northwest, and is now common in similar habitats both west and east of the Cascades. This includes moist riparian zones and meadows in the Coast Range, disturbed agricultural and urban areas at low elevations both east and west of the Cascades, and even mountain meadows at high elevations in the Cascades and Rocky Mountains. This species is widely established in the Pacific Northwest and is most common west of the Cascade Range from southwestern British Columbia to southern Oregon. It also occurs in southern British Columbia, in forests in eastern Washington, and in agricultural areas in the Columbia Basin. This species is introduced from Eurasia. It is has also been found in Alberta and southeastern Canada in North America. This species is a generalist feeding on many kinds of herbaceous plants. 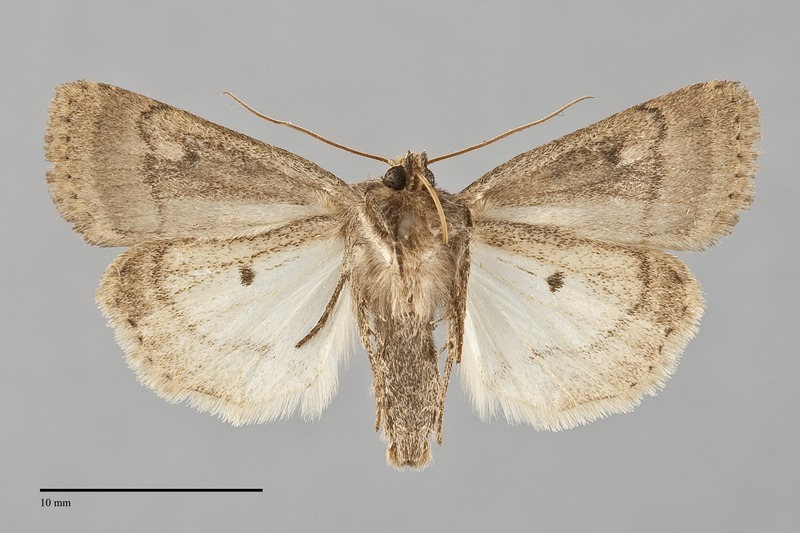 This species flies in late spring and summer and has been collected from late May until early August in the Northwest. It is nocturnal and comes to lights.